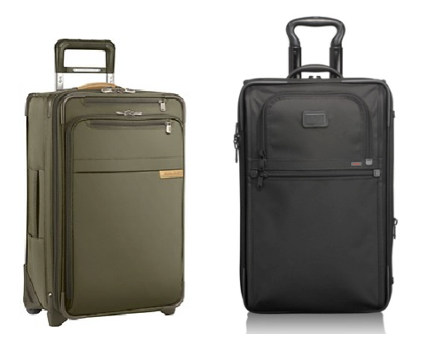 Expensive Gift Idea for Travel Lovers: Luggage! When my parents started buying pieces of luggage for me back in high school, I’ll easily admit that I was less than enthused. A garment bag for a birthday, a carry-on for Hannukah — it really didn’t seem too exciting at the time, but my parents promised that I’d appreciate the pieces later on… and they were right. As for the brands that I prefer, I am partial to both Briggs & Riley and Tumi. Tumi luggage tends to be a teensy bit heavier, but only my grandma thinks that the difference is noticeable. And if you’re lucky enough to receive Tumi luggage, you can bring it back to one of their stores to get it monogrammed. * I’ll always remember when I went on a teen trip to Israel many years ago and everyone else seemed to have the same Ciao! luggage from Costco. It’s so silly now, but at the time I kind of felt left out being the only one who had a large nondescript Briggs & Riley rolling duffle bag. But a funny thing happened toward the end of the second week of the trip. Slowly but surely, everyone’s luggage started falling apart. Handles were falling off, seams were ripping, wheels came unhinged, and by the end of the third week, it seemed like I was the only kid without duct tape holding my suitcase together in some way. It was then that I began to realize how much I appreciated my seemingly lame birthday presents from my parents.